The new vCenter Server Appliance has a new deployment model, both architectural wise and installation wise. I wrote extensively about the architectural changes in this post, so I will focus on how to deploy it with a Mac using command line tools since if you want to use the graphical setup you need to be running Windows. 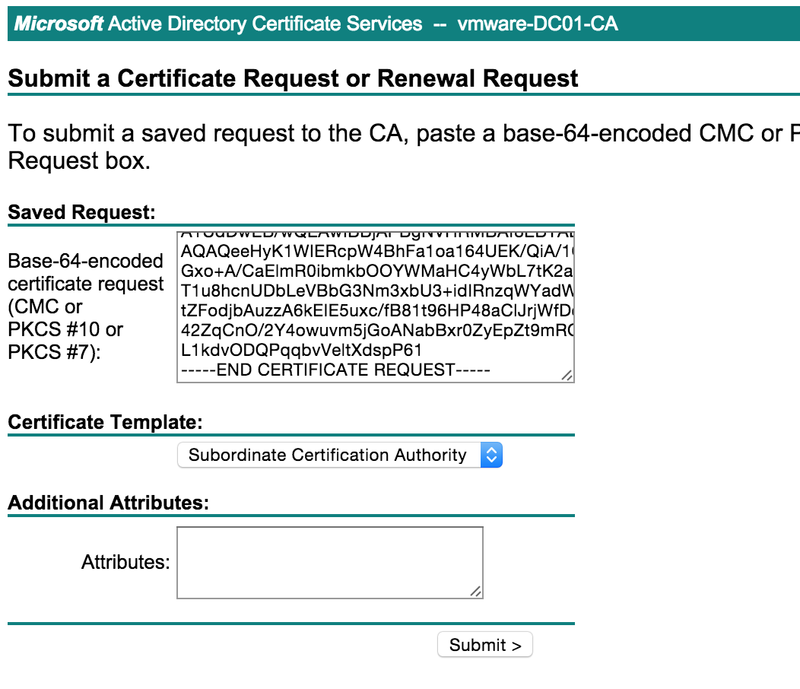 In order to do this you need the ISO file of the vCSA mounted in your Mac. 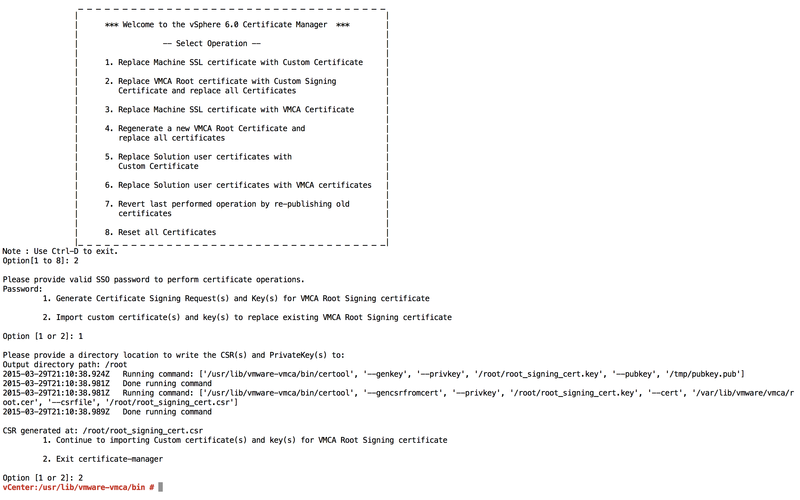 In “/Volumes/VMware VCSA/vcsa-cli-installer/mac” you will find a script called “vcsa-deploy” that requires a JSON file with all the parameters needed to deploy and configure the VCSA on your host. "Sample template to deploy a vCenter Server with an embedded Platform Services Controller." You can see how I used the newly created “vsanDatastore” as my destination datastore. Your SSO password will be checked against complexity compliance by the script before starting the deployment process. Passwords are stored in clear text so make sure not to leave around this file and possibly destroy it after use or change all the passwords right after deployment. You might have noticed that as the system name I used the IP address: I had to do this because I have no DNS (yet) and if you enter a FQDN as system name you need to make sure that it can be resolved both with forward and reverse DNS calls so I had no choice; this will actually be a limitation later on because I will not be able to add the vCSA to a Windows domain so if I want to use Windows credentials to log in my vCenter I will need to setup LDAP authentication. Start vCSA command line installer to deploy vCSA "vCenter60", an embedded node. Please see /var/folders/dp/xq_5cxlx2h71cgy2t83ghkd00000gn/T/vcsa-cli-installer-9wU8aB.log for logging information. Run installer with "-v" or "--verbose" to log detailed information. The SSO password meets the installation requirements. 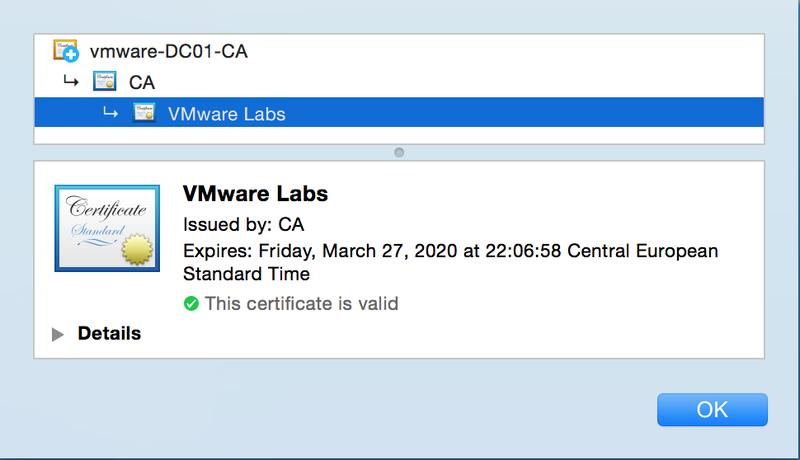 It's time to connecto the the new Web Client, just open your browser to "https://" and then select "Log In To the vSphere Web Client". You should now log in but before starting the normal configuration process I suggest you take care of password expiration in which present in two separate areas in this version of vCSA: the SSO users and the root system user. Now you could start deploying all your VMs but if you try that you will find that vSAN will complain about a policy violation! Do you remember how we needed to change the default policy on the host before we could deploy vCSA? Now all is set and you should be good to go… not really! All you have to do is create a new VMKernel portgroup and flag it for vSAN traffic and your will system be again a little happy vSphere host. This is how I managed to run my lab on a single vSAN node and manage it completely Windows free, which is always a goal for a Mac user like me; with vSphere 6 this is a lot easier than it used to be in the past thanks to improvement in the Web Client (and the fact that the fat client doesn’t connect to vCenter anymore) and also thanks to the new VCSA that comes with deployment tools for Mac. About the storage side of things, I’ve always been running my lab with some kind of virtual storage appliance in the past (Nexenta, Atlantis, Datacore) but those require a lot of memory and processing power and this reduces the number of VMs I can run in my lab simultaneously. It’s true that I can get storage acceleration like this (which is so important in a home lab) but I sacrifice consolidation ratio and add complexity to take into account when I do upgrades and maintenance, so I decided to change my approach and include my physical lab in the process of learning vSAN. If all goes as I would like I will get storage performance without sacrificing too many resources for it and this would be awesome. I also have another spare ST31000524AS that I might add later but that would require me to add a disk controller. Speaking of which, my current controller (C602 AHCI – Patsburg) is not in the vSAN HCL and the queue depth is listed as a pretty depressive value of 31 (per port) but I am still just running a lab and I don’t really need to achieve production grade performance numbers; nevertheless I have been looking around on eBay and it seems like with about €100 I can get a supported disk controller but I decided to wait a few weeks to make sure VMware updates the HCL just because I don’t want to buy something that won’t be on vSphere6/vSAN6 HCL plus I might still get the performance I need with my current setup, or at least this is what I hope. UPDATE: The controller I was keeping an eye on doesn’t seem to be listed in the HCL for vSAN 6 even now that the HCL is reported to be updated so be careful with your lab purchases! For the time being I will test this environment on my current disk controller and learn how to troubleshoot performance bottlenecks in vSAN which is going to be a great exercise anyway. The Samsung 840 Pro will give me much better performance in a vSAN diskgroup so I will put aside the 830 for now. partedUtil is used to manage partitions, the “getptbl” shows the partitions (2 in this case) and the delete command removes them; note how in the end of these commands I needed to specify the partition number on top of which I wanted to execute the operation. At that point with all the disks ready I needed to change the default vSAN policy because otherwise I wouldn’t be able to satisfy the 3-nodes requirement, so I needed to enable the “ForceProvisioning” setting. Considering that at some point vSAN will need to destage writes from SSD to HDD I also decided to enable StripeWidth and set it to “3” so I could take advantage of all of my 3 HDD when IOs involve the magnetic disks. Design and Sizing Guide” (http://goo.gl/BePpyI) before making any architectural decision. esxcli vsan policy setdefault -c cluster -p "((\"hostFailuresToTolerate\" i0) (\"forceProvisioning\" i1) (\"stripeWidth\" i3))"
esxcli vsan policy setdefault -c vdisk -p "((\"hostFailuresToTolerate\" i0) (\"forceProvisioning\" i1) (\"stripeWidth\" i3))"
esxcli vsan policy setdefault -c vmnamespace -p "((\"hostFailuresToTolerate\" i0) (\"forceProvisioning\" i1) (\"stripeWidth\" i3))"
esxcli vsan policy setdefault -c vmswap -p "((\"hostFailuresToTolerate\" i0) (\"forceProvisioning\" i1) (\"stripeWidth\" i3))"
esxcli vsan policy setdefault -c vmem -p "((\"hostFailuresToTolerate\" i0) (\"forceProvisioning\" i1) (\"stripeWidth\" i3))"
The next step will be to deploy vCenter on this datastore; I will be using VCSA and I will show you how to do it with a Mac. 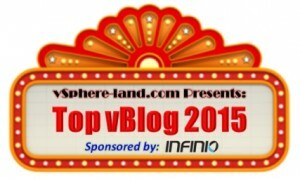 Top vBlog 2015 Voting Started! As every year the Top vBlog 2015 voting has started, so if you like the content of my blog (even if can’t write as often as i would like) please spend a minute to give me your preference! Voting is open until the 19 of March.